After resting most of the week with only a short run on Monday, I decided to plan for a run while at a soccer tournament in Memphis, TN for the weekend. Turns out they have a great little trail system in the heart of Memphis and its suburbs including paved and unpaved trails along the Wolf River as well as multipler park systems connecting different greenways throughout Memphis. 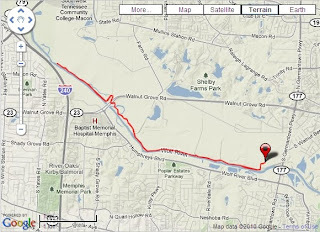 I opted to run a trail section along the Wolf River, aptly called the Wolf River Trail. I chose to go for a 10 mile out & back run at 7AM and there were hardlty any folks out running on these trails aside from a couple of other cars parked at the trailhead. The unpaved trails run along the North side of the river and the paved trails run along the South side of the river. Not having run here before, I was getting nervous every so often when I came upon a trail crossing. However, I just decided to always turn towards the river which should keep me right on track, and it did. This trail was really perfect for a run, it had a few very slight inclines and dips, just enough to keep you honest. Some trail sections must have previosuly been washed out as there were a number of what I would call sandboxes (trail areas filled in with soft beach like sand). These areas felt like you were running in quick sand, a great workout for sure. With the exception of a couple of powerline cuts the entire 5 mile section of trails that I ran was covered by a tree canopy. You were barely ever exposed to the sun while running alongside the river. Overall, it was a great trail run. I even managed to pass a couple of mountain bikers which was a weird feeling. They were struggling up a hill as I was "flying" past them;-) They wouldn't catch up to me for at least a quarter mile. I definitely made me pick up my pace for a time as I did not want to look like an idiot passing them on the uphill only to be immediately passed by them again. However, after a quarter mile, I slowed my pace and let them pass once they caught up to me. Hey, it was fun while it lasted. Once I made it to my 5 mile turnaround point, I started to come across a lot more runners that before. I guess these were the 8 AM runners finally hitting the trails for their morning runs. Lots more runner traffic than I usually witness on our local Monte Sano trails. I kept my pace above 9:30 minutes per mile, just the right pace for a recovery trail run during a taper week. Two more weeks of tapering before the big event, the Pinhoti 100 Endurance Run, my first attempt at a 100 mile race.